SOLfusion is a powerful centralized workflow application that allows users to stage and sequence tasks needed to produce desired output. SOLfusion is designed to complement and integrate with other products from Solimar Systems, including Rubika, the Solimar Print Director Enterprise, iCONVERT, SOLscript and SOLsearcher Enterprise. These software products provide a comprehensive suite of “middleware” that work together to provide control and management of high-volume production print environments. SOLfusion supports tasks such as executing external processes and scripts, indexing of PDF documents and running Rubika Process configurations. SOLfusion’s integrated workflow provides users with complete control of high-value documents independent of the data’s source or final destination. The modular architecture of SOLfusion gives users the flexibility to stage and sequence tasks as needed to support business critical processes. Traditionally, transactional document workflows are inherently difficult to manage and involve many manual interventions. Even with today’s sophisticated processing, the need to pass documents through disparate systems is a complex and error-prone process. SOLfusion provides a solution to fuse together today’s demanding and complicated workflows. SOLfusion is a process management application that automates multiple sets of document production tasks. Optimized for transactional environments, SOLfusion seamlessly enables the integration of solutions from Solimar, 3rd party vendors and other external processes. 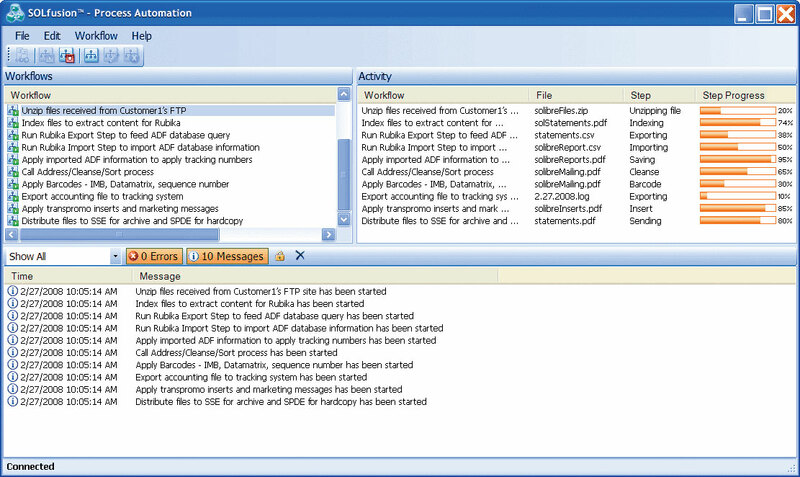 The comprehensive user interface of SOLfusion allows for workflow processing of external processes and scripts to be managed and monitored through graphical status bars and messaging activity. Each workflow runs independently in a “thread-safe” environment, preventing data conflicts and processing errors. SOLfusion is capable of controlling external processes and scripts, including exchanging data and job status information. This functionality is part of Solimar’s overall production job control for integration with external production processes and Automated Document Factory (ADF) workflows. As print center environments range in complexity from very simple job management to highly complex, SOLfusion manages multi-stage processing routines requiring integration and data exchange between multiple systems. Clients find SOLfusion an integral piece to the complex workflow puzzle by providing a central gateway into process automation.